Montpelier /mɒntˈpiːliər/ is a city in the U.S. state of Vermont that serves as the state capital and the shire town (county seat) of Washington County. As the capital of Vermont, Montpelier is the site of the Vermont State House, seat of the legislative branch of Vermont government. The population was 7,855 at the 2010 census. By population, it is the smallest state capital in the United States. The Vermont College of Fine Arts, and New England Culinary Institute are located in Montpelier. Montpelier is located at 44°15′N 72°34′W﻿ / ﻿44.25, -72.567 (44.2500, -72.5667) in the north-central area of Vermont. The city center is a flat clay zone (elevation ~520 ft/158 m), surrounded by hills and granite ledges. Towne Hill runs in a 2-mile (3.2 km) ridge (~900 ft/275 m) along the northern edge of the city. Montpelier is situated among foothills just to the east of the Green Mountains. A campus of the Community College of Vermont. Montpelier High School is the city's only high school. Main Street Middle School is the city's only middle school. Union Elementary School is Montpelier's only elementary school. Vermont College of Fine Arts is a low-residency graduate school offering Masters of Fine Arts degrees in visual arts, writing, and writing for children and young adults. New England Culinary Institute, named one of the top three culinary schools in the nation. The Union Institute and University of Vermont Center Master of Education program offers education students a low-residency program that combines independent study with academic classes and workshops. Because Vermont's founders deliberately placed the capital near the geographic center of the state, Montpelier became one of Vermont's most readily accessible cities and towns. Amtrak, the national rail passenger system, provides daily service from Montpelier Junction (Berlin), operating the Vermonter between St. Albans, Vermont and Washington, D.C. Greyhound Bus Lines operates buses that serve Montpelier. The Green Mountain Transit Authority (GMTA) operates a local bus network throughout the micropolitan area, with stops in Montpelier and Barre, including nearby Waterbury, the Vermont State House, Ben & Jerry's factory, and the local Berlin Mall. GMTA and its sister bus company in Burlington, the Chittenden Country Transit Authority, operate a series of LINK commuter buses with stops in Montpelier, Burlington and Waterbury. A few small taxi companies serve the area. ^ Federal Writers' Project of the Works Progress Administration for the State of Vermont (1996). Vermont: A guide to the Green Mountain State. The Stephen Greene Press. pp. 117. ^ "Montpelier: Economy-Major Industries". City.com. 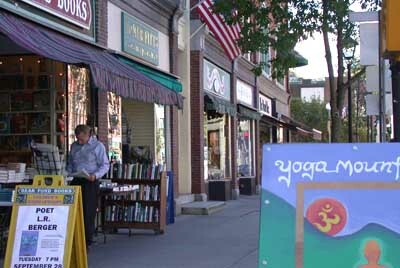 http://www.city-data.com/us-cities/The-Northeast/Montpelier-Economy.html. Retrieved 1 April 2011. ^ "George Dewey (1837-1917) Family Papers, 1844-1901 MS 125". http://www.vermonthistory.org/documents/findaid/dewey.pdf. Retrieved April 14, 2013. ^ "NOWData - NOAA Online Weather Data". National Oceanic and Atmospheric Administration. http://www.nws.noaa.gov/climate/xmacis.php?wfo=btv. Retrieved June 10, 2013. ^ "Capital City Concerts - Montpelier Vermont's Premiere Classical Concert Series". http://www.capitalcityconcerts.org. Retrieved April 14, 2013. Coolidge, A. J. & Mansfield, J. B. (1859). A History and Description of New England. Boston, Massachusetts. http://books.google.com/books?id=OcoMAAAAYAAJ&pg=PA9&lpg=PA9. This page uses content from the English language Wikipedia. The original content was at Montpelier, Vermont. The list of authors can be seen in the page history. As with this Familypedia wiki, the content of Wikipedia is available under the Creative Commons License.